Just call me the Moses of meat. Like the biblical hero, I wandered the desert for what seems like forever, or at least a week. While the real Moses delivered a people to the promised land, I , as promised, delivered the lowdown on the hot dogs in the Arizona Fall League. 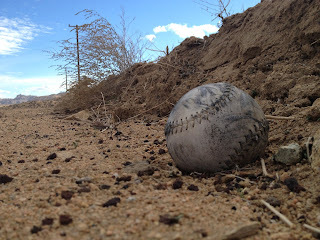 Call me conceited, but I think my quest was slightly more noteworthy; at least to baseball fans. The dude in robe and beard brought forth the Ten Commandments down from Mount Sinai. I bring forth Ten Tidbits from taking in a week of Arizona Fall League action. The AFL is one of baseball’s best kept secrets; even to those living in the Phoenix area. Only the most ardent fans even know of its existence. Crowds are small. Really small. You can catch a game in a spring training facility with a crowd of a few hundred. Most games are noonish, or at least afternoon. A few are in the evening. Day games are normally nice weather-wise. If you attend a night game dress warmly. Tickets are only sold an hour before gametime if getting a seat at the ballpark on game day. Tickets are very reasonable. Eight bucks. It’s festival seating at every game, meaning your ticket lets you sit in any open seat. While you get a great break on ticket prices, you do not on concessions. The AFL has an all-star game mid-season. The concessions are scaled WAY back. Expect the basics and nothing more. 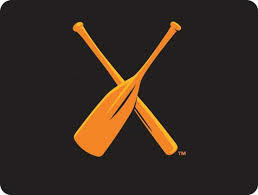 You will sit next to real baseball fans, the conversation is amazing if baseball is your thing. Then there are the hot dogs. I truly expected at least some sort of Fall League dog, or a team favorite or two. By and large the hot dogs fell flat. A few ballparks offered up a slight variation on the dogs but most just offered a regular hot dog. The same ballparks during spring training had some awesome eats. The Nogales Sonoran Dog. Yes, it is that delicious. But, I get it. It is hard to offer up some crazy, over-the-top dog when you only have 200 fans in the seats. It is a lot of time and expense to please 60 or so fans that would probably buy a monster dog at an AFL game. Still, each team could offer one with little effort, and I detailed a dog for each AFL team in their respective blog. I’ll recap those in the next post. Hot dog takeaway? For an afternoon game skip the meal at the ballpark and get a wiener at Short Leash Hot Dogs near downtown Phoenix. Ask for their baseball-themed hot dog. If you are going to an evening game, grab a small snack prior to the game and then after hit the Nogales food truck after 7pm at the intersection of 20th and East Indian School Road; best dog in Phoenix. Tell them Moses sent you. Typically, the Arizona Fall League has six teams that play in six different spring training facilities. This year, the ballpark for the Surprise Saguaros is undergoing renovation (hopefully including a new hot dog stand). Therefore, the Saguaros are playing this AFL season at Salt River at Talking Stick; the same ballpark as the Salt River Rafters. For those of you devoid of a desert dictionary, a saguaro is that big cactus with the arms (usually two) bent at ninety degree angles. It looks kind of humanlike in some ways. If you are a Dallas Cowboy fan you may not know that is sort of looks like a referee signalling a touchdown. If you are in or have ever been in the French armed forces, you know this as the international sign for surrender. Normally, I would rate the hot dog here. But it is the same dog as they serve at Salt River, because you see, they are playing at Salt River. So I’ll spare you the details. Suffice to say it was a larger hot dog. Putting jelly and other weird stuff on hot dogs is all the rage, and of course it could be optional. But if you want to excel in the world of hot dogs, you gotta push the envelope. While I personally dig Camelback Ranch, all of the Arizona Fall League ballparks are nice. And many believe that Salt River at Talking Stick is the nicest. Hard to argue with them, it really is fantabulous venue. It is also the only professional baseball park built on Indian ground. Salt River is also the only team that offers up anything close to a monster dog. For nine bucks you can get a footlong, half-pound hot dog. Nothing special other than its size. I have to give them credit though as they seem to be the only ballpark trying to give the fans something to marvel at as they eat it. Value-at $9 it is pricey. $7 is a better price tag for this dog. The size of it helped it out weighing in at 19.5 overall. What they really need is a signature sausage at this ballpark. If you are going to go big, go big or go home. Camelback Ranch is my favorite spring training venue. It has a southwest feel, great architecture, it is away from the hubbub of the city and it has a great view. 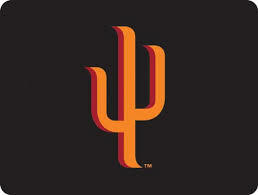 It is also home to the Glendale Desert Dogs of the Arizona Fall League. What is not to like about a name like Desert Dogs? I attended on Veteran’s Day. I was asked if I was a veteran upon entering, and after answering in the affirmative (that’s military jargon for yes) a man who I assume was the facility manager shook my hand, thanked me for my service and then gave me a voucher for a free team hat in the stadium store. These were not cheesy, cheap caps either. They were fitted wool caps sporting a great Desert Dogs logo. Very nice gesture by the Glendale team. Thanks. And I intend to wear it to the rest of the AFL games. Glendale also gets some credit for being the only team so far to offer what might be considered a specialty hot dog. Camelback Ranch is the spring training facility for the Los Angeles Dodgers. As a result the Desert Dogs serve Dodger Dogs, a main staple at Dodger Stadium. I am not a fan of the Farmer John frank, but I give the team credit for keeping the hot dog team-affiliated. Wow, finally a team to break the 20 barrier by half a point. While I continue to be underwhelmed by the dogs in the AFL, the Dodger Dog takes the lead. 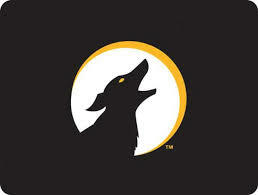 Now that’s a dog that will get you howling at the moon. 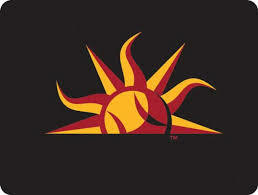 The Mesa Solar Sox play in the newest ballpark in the Phoenix area: Sloan Park. Having been there in March I was looking forward to returning as it is a truly spectacular venue. I was also sure they would have a Chicago Dog. It is, after all, the spring training home of the those lovable losers the Chicago Cubs. I was wrong. The Solar Sox do offer a regular hot dog, a Polish dog and a brat so they have a better than average selection. I opted for the brat since the Chicago area is known for them and it was the biggest dog available. At least Mesa had the foresight to stock up on some sauerkraut for the brat. There were also onions and jalapenos available. While this sounds sparse, it is actually one of the better condiments selection in the Arizona Fall League. What was not enviable at Sloan Park was the service. To date it had the biggest crowd, but it wasn’t huge. It took me TWO INNINGS of standing in line to get a brat. No kidding. TWO INNINGS. I have no idea what the holdup was. Once I was at the counter it took me about two minutes to complete the entire transaction. Unacceptable for any sports venue. Because the sun is mainly yellow, and hot. Get it? If you remember, when I visited all ten Cactus League ballparks for spring training this March, Scottsdale ended up on top. The offered a great dog at a very nice ballpark. Hitting the game on a chilly Tuesday night I had high expectations. Unfortunately, spring training gets more attention for dog offerings than the Arizona Fall League. I get it. The crowds are sparse and the season is short. But this was the second hot dog in as many ballparks in the AFL that, while decent tasting, was not really much to crow about. Scottsdale uses a Block and Barrel frank and offered sauerkraut, albeit in small portions. Toss in mustard and jalapenos and you have a decent dog. 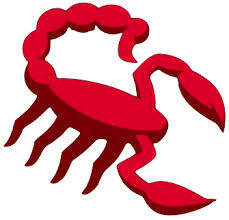 Because scorpions live in the hot desert, their sting is hot and their logo is red. Get it? Hopefully Scottsdale does. I look forward to eating this dog next year. A Javelina is a small, wild pig like creature, that lives in the desert. I knew you didn’t know that. The only reason I know is that if you leave your tent open while camping in Big Bend National Park they will enter in search of food. Trust me on this. The Peoria Javelinas play at the Peoria Sports Complex on the west side of Phoenix. You can read my blog from spring training when I visited last March if you want some detail about the ballpark. It is a great facility with ample parking and easy to get to. Not that parking is an issue. This was my first Arizona Fall League game and I found that most games draw a few hundred fans at best. It was so quiet I could hear the umpires talking. Seriously. It was kind of eerie. That brings us to the concessions confessions. In Peoria you have basically three choices: a regular hot dog, or a regular hot dog with either a jalapeno or cheese infused frank. Farmer John is the frank supplier, they are better known as the manufacturer of the Dodger Dog. For a buck you can get chili on any dog. While 18 of 30 seems low, we will have to see how it ranks among other AFL teams. I can tell you now that it looks like the Fall League hot dogs are not going to be on par with either spring training, or regular season major or minor league offerings. It might be a long week for hot dog explorers. 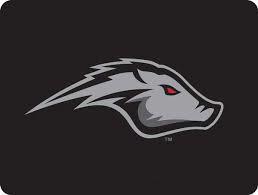 That is a dog fans could enjoy and make the eating experience at Peoria Sports Complex unique to the Javelinas. The World Series is in the can. Congrats to the Royals, a well deserved world championship. Now fans sink into that chasm of despair between now and March known as the off-season. There is a glimmer of interest and hope as the winter meetings are held where blockbuster trades are made and free agents are signed. But otherwise, baseball is over. Or is it? Look west dear fan. Phoenix to be precise. I present to you the Arizona Fall League. This league was formed to give prospects and younger umpires some extra development after the minor league season ended. There are six teams that play in five of the Cactus League spring training facilities (two teams share a facility). If you read my report of hot dogs during the Cactus League season, you know much about the ballparks already. But which has the best specialty dog? You don’t know? Me neither. But I am going to find out. That’s right, while you drown in your tears of sorrow about the lack of hardball available to watch, I am headed to Phoenix on November 9 to catch a game and down a dog in each of the Arizona Fall League ballparks. Don’t be jealous. Ok, you can be jealous. Live in the area? Meet me at the ballpark and I will let you buy me a ticket, dog and a beer. Otherwise, stay tuned on reports of dogs and how my tan is coming along.